Each year I predict that Spurs would be the team to crack the top four, and while many have opined that Arsenal would be the team to lose out at the expense of their North London rivals, I always felt it would be Liverpool losing out. Now finally that looks to be on the cards. Last season Liverpool pushed United to the title. Much was expected of them this season. Many, admittedly within the camp and their fan base, felt this would be there year. That proved to be far from the truth. What we have seen this season is that Liverpools title challenge last season was a once off surprise and not the dawning of a new period of success. They are a team with not enough quality and over reliant on the little that they do have. While many would suggest that Rafa is a genius, this stems solely from the Champions League success of his first season. A success born from an inherited squad. It’s what has happened since that has been the problem. They have stagnated as a top four club and this seasons decline has been a long time coming. It’s fine to turn up for a couple of big games a season but it’s the 30 odd other games that win you titles. By contrast Spurs have been on the verge of breaking into the top 4 for years. That they haven’t has been mostly down to their form against the big teams where they have flattered to deceive time and again. Not so now. This last week they have beaten both Arsenal and Chelsea and travel to United on Saturday to try to make it 3 in a row. It’s a remarkable record at the business end of the season. While they have steadily build their squad they have had to compete with the shift in power that has seen Manchester City splash the cash to compete for 4th place. In the penultimate weekend these two will battle it out for what should be a winner takes all 4th place play off. The number of English, and British players, in the Spurs squad must be a factor in their rise. King, Dawson, Jenas, Defoe, Crouch and Bale, supplemented by some foreign flair and experience is a better recipe than Rafa’s bit part foreign mercenaries.It’s meant that there is less time needed for players to adapt and get to grips with both the team and the league. The relatively smaller squad to that of United and Chelsea has meant that they’ve had to persist with the likes of Gomez in goal, who had a nightmare start to his career at Spurs, and Roman Pav has had to remain with them, and is now coming good. With the right investment, and there is little room for error, they can sustain their push next season. They’ll have to find a blueprint that would take them to the next level and not follow Liverpool path. Next seasons race for 4th, with Spurs, City, Liverpool, Villa and Everton all comepeting promises to be one of the most intense yet. Ask any top footballer and chances are you’ll be told that Dimitar Berbatov is a great footballer. Ask any Spurs fan and they’ll probably tell you he’s a prat (anyone who leaves usually is) but they’ll say he was a world class forward. Ask a United fan and you’ll get differing views. So what do we make of the enigmatic Bulgarian? As much as United have failed to see the best of him, or anywhere near the best of him, there is little doubt that he is a great forward. But why have United not seen this? In Germany he was impressive. At Spurs he was magical. At United he’s been a 30m flop. And is that the reason? £31m is closer to the exact figure and it made him United’s most expensive player. That comes with a lot of expectation. Expectation is just that – it is not always delivered. At Spurs he formed a dangerous partnership with Robbie Keane. They both left Spurs and have not been as dangerous since. Was the partnership one made in heaven? The stats sure make it look so. They formed the perfect foil, Berbatov the energy conserving, wonderful touch player, with keane the energetic, unorthodox forward. They both like to come deep, but in different ways. keane hurries back, rushing at the defence to regain possession. Berbatov waits in open space and looks to unlock defenses. They both scored goals too. At United Berbatov arrived when Tevez and Rooney were the front two. Clearly from where the season went Berbatov was bought to play with Rooney and Tevez was moved on. Many United fans use this as the reason for Berbatov’s unpopularity. They would rather have Tevez. Yet Fergie wanted and got Berbatov to play with Rooney. 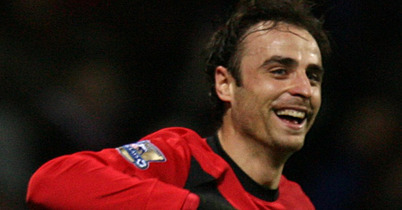 After a season of bedding in much was expected of Berbatov this year. It hasn’t happened. It’s even got to a stage that United prefer to play with just Rooney upfront and Berbatov sits on the bench. In truth he is not a player in decline, but one who isn’t suited to United. United players are full of energy and work rate. Berbatov isn’t. They style and system is not suited to him and it’s Rooney that is the focal point of play, as it should be. Berbatov was an idea that looked good but just hasn’t worked. What this has meant is that he hasn’t had the game time to be effective or to adapt and fit in with the United way. He starts, sits on the bench for a few weeks, then plays again. He needs to be playing week in and week out, and maybe if he had been United would be seeing a different Berbatov, the Spurs version. But with things so tight at the top, in terms of domestic and Europe, United don’t have the luxury of sticking with a learning player. So Berbatov may be shipped off, at a loss, next season. Don’t be surprised if wherever he finds himself next season we see goals and energy from the forward. Maybe he’ll still be at United. Maybe he’ll be able to play in their system. Maybe he’ll be a success. Maybe. Liverpool supporters are probably sick to death of the Liverpool bashing in the media over the last few weeks, but the fact is they are giving the press so much material, and can expect little else. Their form has been terrible, and apart from one match, against United, they have looked more like relegation candidates then league challengers. What that suggests is that they seem to get their spirit up for the derby and are unable to do the same for all other games, domestic or in Europe. That’s a sad indication of the control Rafa has over his misfiring team. Last night they were lucky to get away with a point against Birmingham. That they did escape with a draw, and not their 6th league defeat of the season, owed everything to do with the bane of football – diving. When Americans think of soccer, they don’t think of the game we all know and love, they think of men falling and writhing around with exaggerated pain. They call it a sissy’s game, forgetting for convenience that their “football” is played with more pads and protection that an over cautious, paranoid, parents baby proofing house. However the fact is that diving, and theatrics, have become an embarrassment and shame of the sport, and not a way to showcase the game. Diving is more prevalent in Spain and Italy than it is in England, but that isn’t saying much. It hasn’t so much as creeped into English football but rather immersed itself in what many see as the strongest league in the world. Make no mistake, these players aren’t being clever, but are cheating. They are conning the ref’s and are shamming and embarrassing their team, their club, their fans and the sport. David Ngog’s goal last night was a brilliant and lethal finish. He hit that ball as sweet as he could ever hope. But his biggest contribution to his team would be by cheating and winning his team a penalty in the second half. He should be ashamed of himself but will probably be congratulated by his team mates for gaining them a point. Rafa even admitted afterwards that Ngog said he didn’t think it was a penalty. While Rafa did admit so much, and that is more than most managers would do, the game needs managers and team mates to come out against such behaviour and not defend it when it benefits them, and speak out when it goes against them. You can’t have it both ways. Lets name and shame divers – even if they play for your team. The best players are as guilt as the less talented players in the league. When Christiano Ronaldo first game to England he was guilty of diving a lot. It was a trait he brought with him from Portugal, as was very evident when Porto played English teams in the Champions League. While Ronaldo curbed his diving as his career progressed, perhaps with prompting from his team mates and manager, his early years of falling to the ground hurt him later as defenders got away with kicking lumps out of him and ref’s letting his early reputation cloud their decisions. Before Ronaldo left for Spain he was denied many legitimate penalties with refs falsely accusing him of diving. The ground work was laid in his teens, much to his disadvantage. Another United player, and again a Portuguese player, Nani, is another who needs to stay on his feet more. Nani doesn’t actually dive in the sense that Ngog did, he tends to go to ground at the slightest bit of contact, rolling around, clutching himself, as if he’s been shot. If Nani stayed on his feet his United career would probably be more advanced then it is. Contact that actually takes him to ground will get him free kicks, going to ground to easily, and the theatrics that follow, will only harm his development and gain him an unwanted reputation. Like Nani, Arsenals Robin van Persie is not actually a diver, per say. When contact is made he makes the most of it, ensuring that he gets a free kick or penalty. He’s more of an embellisher than a cheat. He gets fouled and then theatrically goes to ground, making sure the ref and everyone else knows that he has been fouled. While not as shameful as Ngog’s theatrics, it is again something that should be cut down. While not actually cheating a player of his skill and class has more to offer young fans then this. Another player who’s skill and talent are supplemented by bouts of cheating is Chelsea’s Drogba. Drogba is perhaps one of the strongest players in the league, but like Nani he just needs a feather touch to go down as if he’s been shot. He then rolls around, complaining, limps when he gets up, and miraculously fully recovers once the defender has been given a card, and steps up to take the free kick. Drogba also doesn’t need a touch to go down. He’s happy to dive when he can. There’s no doubt that on form he is up there with the best in the world, but this part of his game is one that he can do without. 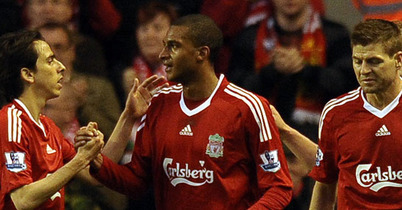 Ngog is in good company at Liverpool and is following the example of his captain Steven Gerrard. Liverpool fans have been very quick to chastise Ronaldo, Drogba, van Persie and co for diving, but because of the god worshipping they bestow on Gerrard they are blind to see that he is probably the worst offender in the league. Gerrard doesn’t even need the player to be close to him to put in an Olympic style dive. His reputation is well known outside of Liverpool and it is the reason why non Liverpool fans don’t speak highly of a player who on his day can be the best in the world. As captain of Liverpool Gerrard should be setting a better example, but his diving has become part of his game. There should not be a place for diving in soccer. With most top flight games on TV and subject to scrutiny from all angles, diver will be caught out, as Ngog was last night. Ngog has not lived up to the hype that Benitez has placed on his young player, but he has now found a label that all other players and ref’s will be aware of – cheat. The shame and embarrassment must be cast out of the game. Divers must be called out – don’t let your love for a player cloud that. On Wednesday it looked like there was a chance that Michael Owen could be playing for Everton or Aston Villa, but more likely Stoke or Hull. The Newcastle player had just become a free transfer target having let his contract run down and was looking at his limited options. Four years of injury problems at Newcastle had made the once prolific Liverpool, Real Madrid and England striker a player who’s career seemed to winding down with the only real hopes of a mid table or relegation threatened team willing to take a chance on him. And then Sir Alex called. 48 hours later Owen was signing for the Champions, he was a Manchester United player. With Ronaldo and Tevez gone United were looking to reinforce their attacking lines with a goal scorer. The 80 million pounds brought in from the Ronaldo sale meant United have money to burn most of the games big name strikers were mentioned. United seemed on the verge of signing Karim Benzema before it was announced that he too would be heading to Madrid. David Villa seems set on staying in Spain, and the likes of Huntelaar, Fabiano, Kun Aguero and Ibrahimovic have all been linked at one time or other. There is still two months of the transfer window left and United may still bring in a big name expensive signing, but on Friday evening Michael Owen became a free transfer signing for Manchester United. Many see this as a risk by Sir Alex, with none of the other top teams seeing Owen as a viable option. Liverpool fans have come out violently aggressive and bitter about their once goal scoring legend signing for United. Opinions are split on the signing but one thing is certain, Michael Owen on a free is a risk worth taking, and a great bit of business by United. If Owens fitness continues to be a problem the consolation for United will be that he was free. But the forward believes his injury problems are behind him and was put through the most stringent medical in the clubs history before signing for far less then he was on at Newcastle. The gamble is one worth taking. The desire is still there from Owen and is clearly evident in his taking a huge pack cut to play for a team that gives him his best chance at honours and at getting back into the England fold. In a world cup year Owen will be best placed to show Capello that he is not finished, and in playing with Rooney, will give the England selectors something to think about. He has a lot to prove, not to the Liverpool fans vilifying him, but to himself and Capello, and has faith to repay in Sir Alex. United have not played with an out and out goal scorer since Ruud van Nistelrooy left for Real, and Owen will give them that option. Whether coming off the bench or starting, Owen will bring something new to the United attack and the increased options and threat can only be a good thing. A fit Michael Owen, with the desire and burn to restore his name and reputation could be the stroke of genius United need to follow the departure of Ronaldo. Time will tell, but I think this could be a great signing by Manchester United – for them and for Michael Owen. In a week Manchester United have let Christiano Ronaldo and then Carlos Tevez leave Old Trafford. There will no doubt be a lot of comments from all sides coming out about both these departures, but I fear the loss of Tevez is harder to swallow for United fans. Ronaldo’s had his heart in Madrid for a long time now. He has come out and said he decided he wanted to leave United for Madrid last season. As much as United fans have loved what Ronaldo has done on the pitch, the news of his departure did not come as a shock. United fans have had a season to prepare for it and many realised that the world record fee of 80 million pounds was too good an offer to turn down. Ronaldo had some great years at United and he will be missed. Tevez departure is harder to take. The Argentine forward is a United player. His work rate and effort for the team was second to none. United fans took him to heart immediately and all the noises coming out of the Old Trafford board room and from the player himself, after his first season, was that it would be when and not if United would sign the player permanently. As the last season wore on a few grumblings began about why Tevez had not been signed up. He began to start far less often and had to settle for more of a bench role than he, and United fans, liked. Tevez became frustrated at how he was treated and it became more likely that he would leave. And that’s what has now happened. United agreed to pay the 25.5million fee that was asked and offered a 5 year deal to Tevez. When Tevez needed time to think about the offer United took it off the table and announced that Tevez had turned them down and was leaving. There are two things to take from this. Firstly United are not frustrated and did not lose patience with the player himself, but rather with his representatives. Tevez unique situation meant that his rights were owned by a company and not a club and United were finding it difficult to deal with them. That being said, the second point is United have not been fair to the player himself. Tevez wanted time to think about the offer. Many feel that he’s had two years to think about it and shouldn’t have been taking this long to let United know. The general feeling is that if a huge, successful team like United want you for 5 years you say yes please. Had the offer been made at the end of last season there is no doubt that is exactly what would have happened. But Tevez situation with United changed this year and he had to decide if he wanted to remain with the United he played for during his first season or the United he played with in his second. He should have been given the time he needed, his loan spell still had 10 days to run, and United should have done everything to make him stay. With Ronaldo gone Tevez would have played a more important role in the team, and United would have needed that. Yet they have let him go. Another point to consider is if United have known that Ronaldo was leaving this season then why was the team build around him? Surely it would have made more sense to build for a Ronaldoless team and focus on Rooney and Tevez? It’s been said a million times before and will be said a million more, but no player is bigger than the club. United will go on without Ronaldo and Tevez and build a new successful team, just as they did when Hughes and Ince left, when Cantona retired, when Beckham left, and when Keane left. United will go on. Sir Alex has always steered the club in the right direction and will no doubt do so again. Players will be brought in to replace those who leave, and those at the club, Nani, Tosic, Kiko and Welbeck will be given chances to stake a claim for starting births. However the heart and courage of Carlos Tevez will be hard to replace and he will be missed. It says a lot about the man that he has ruled out moving to Liverpool because of the rivalry between the clubs. Yes Carlos Tevez will be missed by United. Good luck to him. You are currently browsing the archives for the Man Utd category.